Note: Each member is only eligible once. 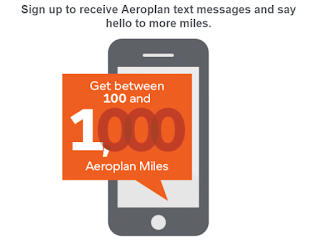 Members who are already signed up to receive Aeroplan text messages are not eligible for this offer. Once you sign up, you’ll receive a confirmation text message, followed 24 hours later by another text message letting you know how many miles you're getting. Based on the feedback I got from my friends (including myself) who signed up for this offer, all of us (~ 5 people) only got 100 Aeroplan miles. Not much, but still good if your Aeroplan miles is about to expired.